I wonder who and what are the Loneman Pai ancestors. Big changes indeed. Looking forward to it! It's good to plan ahead, but don't go leaving us too soon! I apologize for hijacking the thread if that's what I'm doing. Every time I come here it has been overwhelming. I find this entire process fascinating though I wonder how well I'll be able to manage to catch up. I'm obviously new to the forum but I should also say that I'm really young as far as energy work is considered though I'm 32. Where should I be posting to introduce myself? If the forum is being shut down and no new posts what does that ultimately mean for someone like me? I have followed no lineage directly since the concept of one has only showed up in my radar in the last 8 months. I barely got through the NEWCOMERS READ THIS when I had my account deleted. Also I can't imagine doing anything other than tech #1 to start since that is recommended. I apologize if this post is in the wrong place. Thanks for your patience. Namaste. There is no catching up bro, only progress. I doubt I'm gonna catch up with any of the older students anytime soon lol. Start with tech1 and the beginners thread and keep plugging away. You don't think you're gonna get left behind if you're seriously trying do you? Stay strong and stay consistent. But you gotta start at the beginning to get where you want to go. Welcome to the forums brother! it's good that you are posting, so we know you're not a bot or a lurker! Read through the FAQ's and ask any questions you have, so you know what's up. Go to the lonemanpai.com/board/8/loneman-pai-curriculum board and make a log to introduce yourself and log your practice. Don't worry everyone feels overwhelmed when they first join, there is a huge amount of material to process. Just take it one step at a time, cultivating and asking questions/discussing will build your knowledge quickly. Good luck and be active! This is true. I know that ultimately on the grand scheme of things that there is no falling behind since there is only moving forward. But even with that in mind I always feel so lost when I look at the available information on the net. I was looking up just the concept of mingmen and got lost into a huge document regarding the different writings of ancient Chinese practitioners regarding it. Thank you for the encouragement. I'm sure I'll get settled in soon enough. Thank you. I appreciate the direction on where to start posting. The last forum I joined I ended up posting in all the wrong places. oops. It has been a couple weeks since I last attempted reading through the FAQs so I can't recall if I made it all the way through or not before I had my account deleted. I couldn't read fast enough I guess. I have no doubt that being active won't be a problem for me. I do not want to mess things up because I don't want to spend time fixing anything if I can avoid it. No fun wasting time even if there is wisdom gained in the doing. Just be active (especially on the forum while it's around its a gold mine) and keep going! Welcome brother! Thank you. I'll do my best. I'm glad to join the group. Thank you backwards. That sounds very similar to my issue though I've been able to manage the pressure pretty well. Just since I started focusing on my LDT I've experienced a slipping of the UDT back further in my head where there is now a change in the way the energy rests. I used to get a lot of really heavy dense pain above my sinuses but not anymore since it moved. Since this is all very new to me it's a very bizarre thing to experience. Today though I've been getting shooting pain in my crown which isn't new but is pretty uncomfortable. It always makes me a little sad when people tell me about their pain. I'm glad you were able to get adjusted. I'll keep plugging at the Tech #1. I'm just nervous I'm going to do it slightly wrong and then throw something out of whack. lol. You arrived here out of whack. As you've probably gathered your re-entrance here is timely ! Funnily enough most of us were banned in the begging so don't sweat it and keep posting. Will this happen on the same day as the et's? Thank you. I definitely planned on being very active when I first applied. I just needed to figure out the "lay of the land" so to speak but that wasn't fast enough I guess. I'm glad to see I am not the only one. At first it seemed that it was perhaps a sign from the universe just saying to give it up. I guess that's not always the case. I am very young in the sense of energy work familiarity so I hope to leverage the tools the LMP has. I luckily had a tip from someone else I know that has tried applying that things were changing here so I decided to give it one last go. I didn't exactly feel wanted so I wasn't going to push it either. I'm anxious to practice with everyone and see where this takes me. 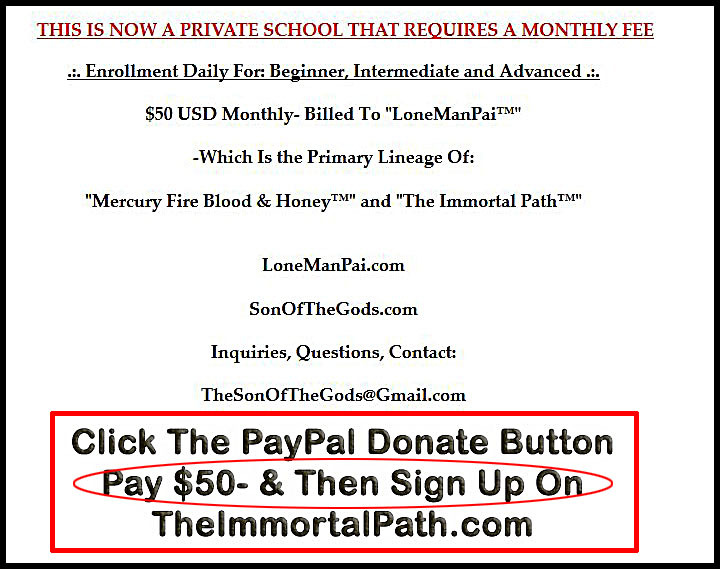 You do acupuncture and want to learn LoneMan Pai™ so you can heal others. I am curious enough to go deeper with this. Are you saying that using it to supplement is really the issue? Think about the intent here. If you were to use LMP to heal others, this would be a service to others. But if your intent was to misuse LMP for your gain(by promoting something like KAP with it or using it to make money in general) you'd simply be serving yourself. What is preferable to you? Gotcha. I'm not trying to be antagonistic or a nuisance so if I am please say so. I'm just looking at it a little deeper to understand more fully. Words tend to be faulty at first glance. So even if a soul decided, not saying I want to, that they could teach better KAP to help others then would this fall along the same line of thought as doing the acupuncture? I can't imagine that every person out there that makes money doing some kind of energy work is going to be out to make themselves rich. Is the Egregore able to make that kind of intelligent decision on who falls within the zone for being a mis-user? Honestly I've never heard of an egregore before coming here. I have heard of energy constructs but I imagine they're different in quite a few ways.